Our response to color is as unique as it is universal, as relevant to our cultural heritage as it is to our own very personal experiences. Because it creates a mood, color can have a chameleonic effect to the viewer. A man in a blue sweater tends to come across as easygoing and personable. Change that color to red and that same individual will be viewed as more challenging, less friendly, even arrogant. Yet we associate that same red with passion and sensuality. A woman at a party in a black cocktail dress is seen as chic, urbane and slightly mysterious. That same woman in a red dress is, to the same observer, perceived as more powerful, sensual and sexually desirable. The most complex response we have to color, however, comes from our own personal experiences. Since external stimuli have tremendous impact on our senses, this has nothing to do with what is sent down the runway. Because color is so evocative to our psyche, we tend to relate specific tones or combinations of tones to an event or period in our past. This, above all else, seems to irrevocably affect how we relate to certain colors, positively or negatively, for the rest of our lives. I truly loathe the combination of black and light pink – and I know the reason why. Before I began working in the fashion industry I was a theater and dance major and attended college to study both. As a freshman I was required to study the fundamentals of ballet. The classes were occupied by a number of young women – quite serious in their studies – who were always dressed the same way: black leotard with pale pink tights, or pale pink leotard with black tights, plus matching leg warmers and pink satin toe shoes. These classes were also ridiculously overcrowded and lacked the proper supervision – consequently by the end of my first semester I had injured myself to the point that I had to withdraw from school entirely in order to recuperate. To this day, any time I come upon black and light pink, I actually feel physical pain – a purely psychosomatic response, but one that will forever affect my perception of those colors. I’m actually very fond of these bright, pure tones for Spring/Summer 2011. They have a clarity that transmits a certain vitality and energy, a hopefulness, that is much needed right now. At the same time there is an audacity to these colors that, while appealing on the page, is likely to be difficult for many women to be comfortable interpreting. In a volatile economy where consumers are especially cautious about purchases and consider every new garment an ‘investment piece’, it’s difficult to imagine a nearly-neon pink trouser or lemon yellow ankle-length halter jumpsuit a viable purchase. These are pieces that can be frustratingly limited in their lifespan – recognizable garments that, because of their tonality, are particularly memorable the first time worn and are consequently difficult to integrate with one’s existing wardrobe or reinterpret to seem fresh and new. This poses a problem to any individuals with a limited budget who, frankly, are the overwhelming majority of consumers. This isn’t to say that you should keep it dark and somber all summer – it’s simply a question of what to invest in. It’s important to remember that runway and reality are two very different things. With this in mind, there are three basic factors to remember when investing in color for Spring/Summer: Quality, Shade, and Placement. Quality is of utmost importance when working with bold hues – inexpensive synthetics and inferior workmanship are far more obvious in a bright color, where every stitch and seam is easier to see than in a dark or neutral. Additionally, quality fabrics dye more richly than their substandard counterparts. Wools and silks, particularly in gabardine or crepe, not only take color deeply but move beautifully on the body. Shade is equally important. Color can have a number of different values – in other words, it can be lighter or darker by adding either white or black. For example, adding white to a pure yellow creates a pastel tint while adding black to that same yellow conjures a mustard shade. In addition, most colors have subtle undertones to them that are either red, blue or yellow. Hues with blue undertones will almost always be easier to wear than those with red or yellow in them. This two-tone ensemble from Lanvin is a perfect example of two different shades of the same color. The darker beet red of the skirt actually has more ‘blue’ in it than the brighter persimmon of the one-shoulder top, which has more ‘yellow’ in it. It seems odd that red can also be blue or yellow, but in the study of color theory it’s actually very rare for a color seen in any visual medium – fashion, art, interior design – to be completely pure. 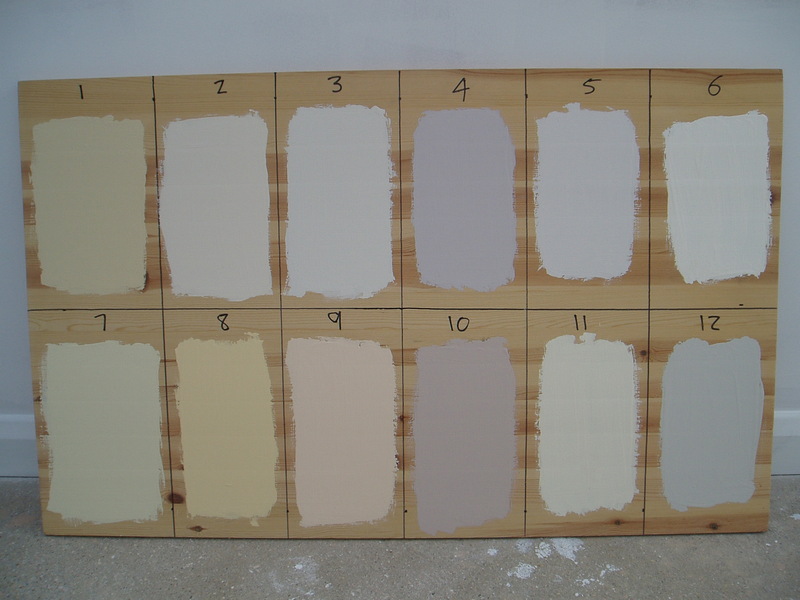 If you want to get an even better idea of this concept, pick up any paint company’s options for the color white – there are dozens of different ‘whites’ – some have blue undertones, some pink, some green. These undertones are so very subtle when applied to a surface that they’re almost impossible to distinguish. Yet, pure unadulterated white on a wall is surprisingly cold and uninviting – hence these options that soften this chilly color to something that is, almost subconsciously, far more appealing. 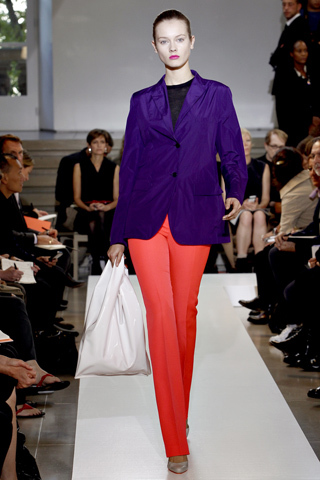 Placement, where on the body or in your ensemble you choose to employ bright color, is crucial. Vibrant tones usually work best on the upper body — blouses, blazers, pullovers and knits instead of bright skirts and trousers. Because when we stride the majority of our movement is from the waist down, a bright color in a bottom seems more blatant, less balanced, than that same color in the upper part of an ensemble. This look from the Gucci runway is a wonderful example – together the blazer, top and pant are a bit overwhelming. By replacing the teal green trouser with a black pant, the look immediately becomes more anchored, less gimmicky. The warm citrus orange of the jacket is a fantastic way to update a wardrobe – there are so many ways to interpret it. Imagine the blazer over a white tank and casual khaki trousers or a tailored camel skirt, or pair it with an simple espresso brown shirtdress. For those who aren’t as committed to color for the coming season, employ shots of these wonderful hues in smaller ways that are both economically feasible and easier to incorporate into an existing wardrobe. Small pops of bright in accessories – scarves, belts, shoes and bags – can update a look without breaking the bank, and have fantastic mix and match possibilities while still blending beautifully with the blacks, whites and neutrals that are already in most women’s closets. Leather goods like bags, belts and shoes are particularly smart investments – if and when you tire of the color you can always have them dyed to a dark neutral. 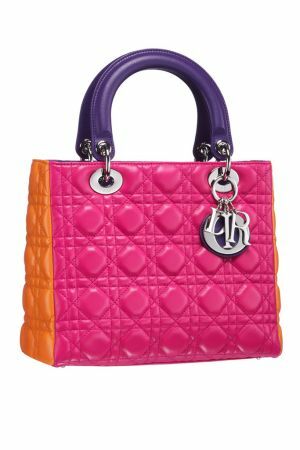 This classic Dior bag, reinterpreted in color-blocking is a witty way to pull in this season’s craze for the colorful. The specificity of the bag, however, means that after a season it may feel a bit ‘done’. Any leather specialist that works with shoe repair can easily dye it navy or black — in essence giving its owner a new, utterly classic accessory for the following fall. When working with powerful tones less is often more. Anchoring a bright with a neutral lends elegance to what could otherwise be overwhelming. Neutral and dark shades will always look more sophisticated, and bold tones from head-to-toe are something that few can pull off well. Vibrant hues do require a certain amount of confidence, but working with them is hardly rocket science. While it’s paramount to wear what feels comfortable to you, the challenge of trying something new often brings out aspects of your personal style and, perhaps the person underneath, that may otherwise not be discovered.